Congratulations to my friends Franky and Mira. They had the most wonderful wedding yesterday at Swan Valley. 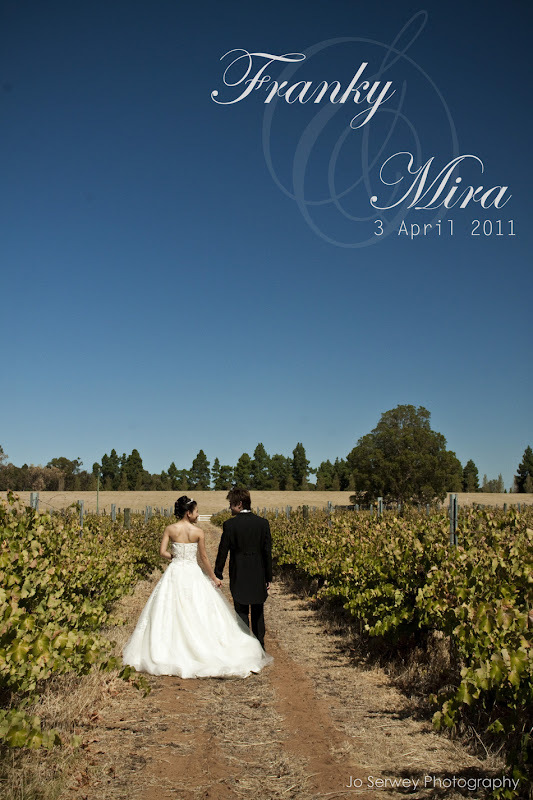 The sky was perfectly blue, wedding dress looks stunning on Mira and the smile on Franky's face is just priceless. I was lucky enough to be the photographer on their wedding day along with some other photo enthusiasts. Honestly, I was pretty nervous about the idea of capturing their important day but excited at the same time! I planned about the shoot, getting all the gears ready, did lots of research just in case I miss out anything and getting a dress that is easy and comfortable enough for the dinner and shooting. It is my first wedding shoot after all! The only thing that I forgot to do is a couple of push ups and runnings for 2 weeks before the wedding to get my stamina going! Although my whole body is aching now (I can't even walk down the stairs properly!!) but it was totally worth it! Capturing people tearing, hugging, congratulating, dancing is really something that I enjoy doing. I can't wait to share the rest of the photos with all of you especially Franky and Mira. I'm sure they will be quite excited to see them too. Congratulations to both of them again and hope to see Lil Frankys and Lil Miras running around soon~!